University of Georgia Press, 9780820324890, 279pp. A lifelong fascination with primates led Dale Peterson to Africa, which he crisscrossed in hope of sighting chimpanzees in the wild. As with any adventure worth retelling, however, Peterson's detours are as notable as his destinations. With the good-natured fatalism of the tested traveler, Peterson tells of trains and riverboats, opportunists and ecotourists, rain forests and shantytowns as he conveys the pitfalls of going forth on a budget as tiny as the continent is vast. Along the way, we also meet Jane Goodall and several other renowned primate researchers and caretakers. This is travel writing with a purpose, an account that inspires both admiration and concern for Africa's people, places, and natural diversity. 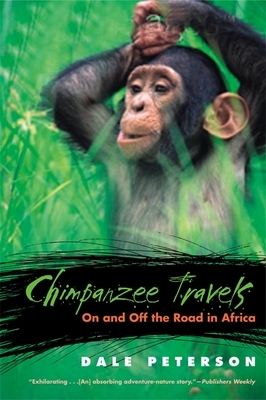 Dale Peterson is also the author of "Chimpanzee Travels: On and Off the Road in Africa," "Storyville, USA" (both Georgia), and "The Deluge and the Ark: A Journey into Primate Worlds." He is co-author, with Richard Wrangham, of "Demonic Males: Apes and the Origins of Human Violence." He teaches at Tufts University.